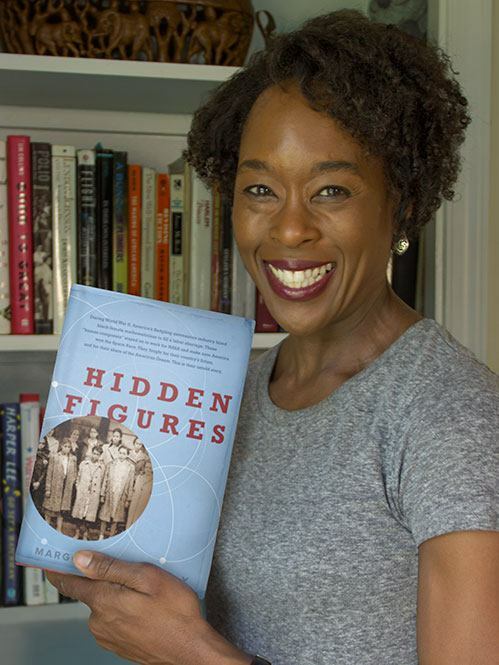 FREDERICKSBURG, VIRGINIA, January 31, 2017 - Margot Lee Shetterly, author ofHidden Figures: The American Dream and the Untold Story of the Black Women Mathematicians Who Helped Win the Space Race, is coming to Fredericksburg on Saturday, March 4, 3-5 p.m. She will appear at the University of Mary Washington's Dodd Auditorium for a free talk and book signing. This event is open to the public. Shetterly's visit is the culminating eventcelebrating this year'sRappahannock Reads, Central Rappahannock Regional Library's (CRRL) month-long community read ofHidden Figures. Her book is about the African American female mathematicians who worked for NASA's Langley Memorial Aeronautical Laboratory in Hampton, Virginia, during the early days of the space program. Margot Lee Shetterly grew up in Hampton, Virginia, where she knew many of the women featured in her book. She is a graduate of the University of Virginia, an Alfred P. Sloan Fellow, the recipient of a Virginia Foundation for the Humanities grant, and the founder of The Human Computer Project, an organization recognizing the women who worked at the National Advisory Committee for Aeronautics (NACA) and NASA from the 1930s through the 1980s. TheHidden Figuresmovie, starring Taraji P. Henson, Octavia Spencer, Janelle Monae, Kirsten Dunst, and Kevin Costner,just won the Screen Actors Guild Award for Outstanding Performance by a Cast in a Motion Picture and has received two Oscar nominations: Best Picture and Octavia Spencer for Best Actress in a Supporting Role. This event is sponsored by the University of Mary Washington Libraries (Platinum sponsor), theStafford County Branch NAACP (Silver sponsor),CTI Real Estate (Bronze sponsor), Holeman Enterprises, LLC (Bronze sponsor),Fredericksburg Area Alumnae Chapter of Delta Sigma Theta (Copper sponsor),Singleton Enterprises, LLC (Copper sponsor), and Nathaniel Singleton, Jr. (Copper sponsor). For more information, contact Michele Brown, Adult Services Coordinator, Central Rappahannock Regional Library,michele.brown@crrl.org, 540-372-1144, Headquarters Library, 1201 Caroline Street, Fredericksburg, VA, 22401.